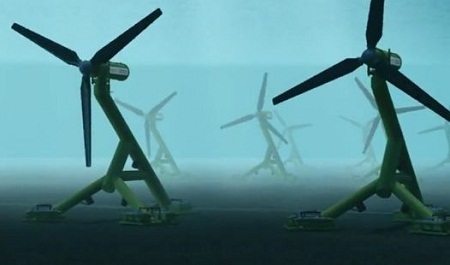 Atlantis Resources is proposing to develop a demonstration tidal array in the Sound of Islay. The proposed tidal array will have an installed capacity of up to 10 MW of renewable power for export to the grid. Islay is the most southerly of the main Inner Hebrides and is located to the southwest of the island of Jura. The Sound of Islay is a stretch of water that separates the islands of Islay and Jura. The bathymetry of the channel constitutes a relatively flat and deep seabed with water depths of up to 62 metres with very steeply sloped sides. The site is generally sheltered from wave action which impacts on the west coasts of both Islay and Jura. Studies thus far indicate that the maximum tidal flow within the Sound is 3.7 m/s, with a mean of 1.2 m/s. The array will be configured in a ‘figure of eight’ created by a 48 metre contour line on the seabed. This site offers a lower average flow speed than the MeyGen site, but as it is both deeper and more sheltered from waves it is possible to deploy larger diameter turbines to capture more energy. The consent conditions allow for deployment of turbines with rotor diameters of up to 26m, giving a swept area more than twice as large as the 18m Phase 1A turbines. Atlantis have received a very high level of interest from prospective turbine suppliers wishing to deploy their technology in these favourable conditions. It is currently unclear which devices will be used for the Sound of Islay project, however it is likely that they will consist of Atlantis Resources’ newly developed AR 1500 which is scheduled for deployment at the Meygen site. The AR series turbines are commercial scale horizontal axis turbines designed for open ocean deployment in the most energetic marine environments on the planet. The Atlantis AR turbines are currently available in a 1MW fixed pitched configuration (AR1000), with a 1.5MW turbine system (AR1500) under development with Atlantis’ technology partner, Lockheed Martin. AR series turbines are deployed using a patented stab system that facilitates rapid deployment, retrieval and subsea connection to shore. There is also potential for Hammerfest Strøm’s (HS) 1.5 MW device to be used which is also scheduled for deployment at the Meygen site. The HS device is a fully submerged, bottom mounted, rotor, variable pitch turbine. The nacelle houses the turbine, gearbox, generator and associated components. The pitch of the rotors is variable to present the most efficient angle of incidence to the oncoming flow. On reversal of the tide the rotors alter pitch so that the turbine generates maximum generation from the tidal environment. Both 1.5 MW devices will have a rotor diameter of 18m. It is estimated that the devices can be installed over a period of 72 days (not including weather downtime). This has made allowance for spring and neap tides. Offshore cables and pre substructure installation activities will be conducted in advance of the installation of nacelles. It is currently planned that each substructure will be lifted, transported and set down during a neap slack tide period. Once moved into position additional ballast will be loaded onto the substructure to secure it against overturning loads imposed by the turbine. Once the substructure is secured in position and stabilised, the high voltage cable will be lifted to the substructure, pulled in and then secured ready for final mating. It is anticipated that positioning, ballasting, pinning, and cable pull will take approximately 56 hours. Throughout the installation process it is unlikely that more than one vessel will be used due to navigational constraints. The final cable design, and ultimately the size of any cables, will be dependent on the electrical system design, cable layout, installation methods and soil characteristics. However, the preferred design is to have one cable per device, thus approximate dimensions can be given. The tripod support structure dimensions are 40m (W) x 30m (L). This will be fixed to the seabed using gravity ballast in the legs and will support the nacelle and rotor structure giving a hub height of between 13.5-16 m from the seabed. A rotor diameter of 18m will give the device a total height from the seabed of approximately 26 m.
Heavy Lift Vessel Heavy lift vessel on site to lift and move substructures onto the barges. Anchor Handling Vessels Move substructures from he barge onto location for ballast operations and cable pull ins. Lift Vessel Will be used to install the nacelles once the site is prepared. Sound of Islay, between the Isle of Jura and mainland Scotland. Marine License (Marine Scotland Act) Marine Scotland Original application granted (Licence Number 04050/11/0, Reference Number: FKB/Z225). Reapplied for after change in cable route. The licensee shall notify the licensing authority of the date of commencement and the date of completion of all operations relating to the licence. Separate notifications are required at the times of commencement and completion. The licensee shall ensure that all substances or articles deposited during the execution of the works are inert and do not contain toxic elements which may be harmful to the marine environment, the living resources which it supports or human health. The licensee shall ensure that only the substances or articles described in Part 1 of the Schedule shall be deposited under authority of the licence and that any debris or waste materials arising during the course of the works are removed from the site of the works for disposal at an approved location above the tidal level of Mean High Water Springs. The substances or articles described in Part 1 of the Schedule (the authorised deposits) shall be deposited in the following authorised deposit area. 'Force majeure' may apply when, due to stress of weather or any other cause, it is necessary to deposit the substances or articles at a location other than that specified above because the safety of human life, or a vessel or vehicle, is threatened. If the substances or articles are deposited in an unauthorised area, full details of the circumstances shall be immediately notified to the licensing authority. The licensee shall, within 28 days of completion of the works or within 28 days of the date of expiry of the licence, whichever is the sooner, submit a written report to the licensing authority stating the nature and quantity of all substances and articles deposited below Mean High Water Springs under authority of the licence. Where appropriate, nil returns must be provided. The licensee shall ensure that copies of the licence are available for inspection by any authorised Enforcement Officer at: the premises of the licensee; the premises of any agent acting on behalf of the licensee; and the site of the works. In the event of the licensee becoming aware that any of the information on which the issue of the licence was based has changed, the licensing authority shall be immediately notified of the details. In the event that the licensee wishes any of the particulars set down in Part 1 of the Schedule to be altered, the licensing authority shall be immediately notified of the alterations. It should be noted that changes can invalidate a licence, and that an application for a new licence may be necessary. The licensee shall ensure that the substances or articles described in Part 1 of the Schedule are located on the sea bed within the authorised deposit area, and shall undertake regular maintenance operations to relocate or remove any deposits that are located out with this area. Any deposits permanently removed from the sea bed shall be disposed of at an appropriate location above the tidal level of Mean High Water Springs. The licensee shall ensure that ancillary equipment deployed or deposited during the course of the works, such as buoys, wires, ropes, ballast weights, anchors and lifting bags, etc is removed as soon as it is no longer required to prevent interference with other legitimate uses of the sea. The licensee shall ensure that the methodology for installation of up to ten tidal turbines will be signed off by the Licensing Authority prior to commencement of works. a) The licensee shall prepare a detailed works schedule and method statement following licence issue. b) The licensee shall ensure that all the works are carried out in accordance with the works schedule and method statement as agreed with the licensing authority. c) The licensee shall put in place a contingency plan in accordance with the requirements of the Oil Pollution Preparedness, Response and Co-operation (OPRC) Convention to deal with the impact of accidental spills of oil or chemicals in the marine environment. The licensee shall also put in place a contingency plan to deal with the impact of catastrophic events on the marine environment. The method of relocation or removal not involving decommissioning shall be; Confirmed when known. Names, and operators, of the vessels to be employed to undertake or support the deposit, relocation or removal operations not involving decommissioning; To be confirmed when the licensee shall ensure that all vessels employed to perform the deposit operation under this licence shall be so constructed and equipped as to be capable of the proper performance of these operations. The licensee shall, where appropriate, undertake monitoring of the area pre and post installation and post decommissioning of the deposits on the sea bed subject to this licence e.g. deployment of a remotely operated vehicle. The monitoring shall incorporate, if deemed to be necessary by the licensing authority, physical, chemical and biological investigations, to access the status of the authorised deposits and their impact in the receiving environment. The scope, frequency and spatial extent of the investigations shall be approved by the licensing authority. The licensee shall submit, where appropriate, written reports to the licensing authority detailing the results of the monitoring. The written reports shall be prepared by the licensee detailing, where appropriate, the status of the authorised deposits and their impact on the receiving environment and their position (latitude and longitude to three decimal places of minutes). The written report should also detail the nature, quantity and fate of all deposits that are relocated and/or replaced on the sea bed during maintenance operations. Previous monitoring reports may be amended by the addition of an appendix detailing new deposits on the sea bed. Should the licensing authority consider it necessary or expedient to remove all deposits made under authority of this licence, for the purpose of protecting the marine environment, the living resources it supports and human health, or of preventing interference with legitimate uses of the sea, the licensee shall undertake to remove those deposits in accordance with the requirements of the licensing authority. Atlantis purchased the Sound of Islay site from Scottish Power Renewables in 2016. The project has full consent, grid and an agreement for lease from the Crown Estate. Atlantis intends to build out the site in 2018. While still under the ownership of Scottish Power Renewables a scoping exercise was carried out to identify the main issues that needed addressing as part of the EIA. Following this a number of consultations with statutory and non-statutory bodies took place along with a variety of environmental surveys. An Environmental Statement was produced to support the necessary licence applications. In July 2010, SPR submitted an application under Section 36 of the Electricity Act 1989 to construct a demonstration tidal array in the Sound of Islay. Consent was given in March 2011. An application for a Marine License was accepted by Marine Scotland in May 2011. Post-consent of these licenses discussions were held with the regulator and, as a result of these discussions related to the interpretation of planning legislation, a number of amendments were made to the development. The principal change in relation to this Marine License application relates to a new cable route to shore. A document titled “Cable Route Enviromnetal Information” was submitted by SSE to Marine Scotland in support of the new application. This document was created to assist Scottish Ministers in reaching a decision as to whether permission should be granted for the proposed new cable route to shore. This change saw the proposed location for the on shore substation move from Jura to Islay. Otter disturbance during construction and decommissioning activities. Marine Mammals: An overall approach to mitigation, monitoring and management is proposed, which forms part of a wider deploy and monitor strategy. SPR commits to putting in place a programme of post installation monitoring and any mitigation considered necessary by regulators to avoid significant effects, as part of an on-going programme of adaptive management. Fish and Shellfish: To mitigate against the impact of noise on shellfish and finfish SPR will adhere to best practice outlined in BS5228-2 (2009) British Standards Code of Practice for noise and vibration control on construction and open sites during all construction activities and best practice guidance in CIRIA C584 (2003) Coastal and Marine Environmental Site Guide during all construction activities. Anadromous fish: No mitigation required; however, contractors will adhere to good construction practice guidance (e.g. CIRIA guidance, SEPA Pollution Prevention Guidelines). Cable design will aim to minimize EMF fields through appropriate shielding to reduce potential impacts with other EMF sensitive species. Elasmobranchs: The use of vessel and / or shore based visual observers would allow teams undertaking installation works to be alerted to the presence of basking sharks in the Sound. On receiving such an alert, appropriate mitigation would be put in place, potentially including avoidance of areas where sharks are feeding and modification (e.g. slowing of vessels) or cessation of installation activity until the sharks have moved on from the installation area. Appropriate procedures would be agreed with Marine Scotland. SPR accepts that there is some uncertainty about some potential impacts from the Development and is committed to undertaking a post installation monitoring programme in order to determine the nature of those impacts. SPR is committed to putting in place measures considered necessary by the regulator to mitigate impacts. Ornithology: Any risk to seabirds of accidental release of marine contaminants will be minimised by adopting safe working practices and having contingency plans in place for dealing with incidents. Good practices will aim to minimise disturbance to seabirds by vessels associated with the proposed development by avoiding, where possible, preferred feeding areas and adopting voluntary speed restrictions. Artificial nest sites for black guillemots located away from the immediate vicinity of the proposed development site should help reduce disturbance effects on the breeding population of this species. Artificial nest sites should take the form of specially designed nest boxes or providing suitable cavities in stone walls or quays next to the sea. It is anticipated that approximately ten such sites should be constructed given the numbers of existing nest sites that may be affected by the proposed development and that not all artificial sites may become occupied. Commercial fisheries: A Safety Management System (including an Emergency Response Coordination Plan (ERCoP), appropriate to the scale and nature of the risks involved by the demonstration array, should be developed and put in place prior to installation of the array. To mitigate against impacts on commercial fishing, turbines and cables should be installed during periods of least fishing activity within the Sound (creeling activity is at its lowest in the summer). Close consultation with local fishermen will help to identify potential mitigation measures. To avoid entanglement resulting in possible capsize of fishing vessel, the array area will be subject to an application in order to designate it a “No Fishing” (Int. Symbol N21) area. Turbines will also be fitted with rope cutters to clear any fishing gear that may become accidentally entangled. Cable protection will be installed where appropriate and care will be taken to avoid bridging during cable installation i.e. cable should be flat on the seabed with no space underneath where fishing gear could become trapped. Intertidal ecology: Construction work will be undertaken during agreed daylight working hours (07:00-18:00), where practicable. Artificial light will not be used next to the coastline or rivers at night to allow otters to migrate through the area undisturbed. Construction activities will maintain a strict footprint of works for the corridor of the cable trenching, and construction vehicles and equipment will not be active on, or stored by, the coastline for longer than is necessary. Sound of Islay Demonstration Tidal Array is located in United Kingdom. The following field surveys were undertaken (or commissioned by) the developer to inform the baseline characterisation. Water current velocity survey by Partrac Ltd.
Water current velocities were measured via the deployment of Acoustic Doppler Current Profiler (ADCP) during the early stages of the development, in order to inform SPR of the possible energy yield from the site. Three bottom mounted ADCPs and one Acoustic Wave and Current Profiler (AWCP) were placed on the seabed within the Sound at four different locations. These were deployed after discussion with SPR to provide a high quality data set of current speed and direction within the Sound of Islay to enable an energy yield assessment to be undertaken. The highest recorded current speed (2.80 m/s or 5.44kts) occured at two hours after high water at the most northerly of the transects, indicating that the strongest tidal flows are associated with the flood phase of the tidal cycle. On the ebb tide (when the flow is moving south) the fastest region of flow holds close to the west side of the channel (Islay side). A marine resource site investigation by iXSurvey. This survey included mapping boundaries where seabed sediments change, defining the subsurface geology and collecting accurate bathymetry data. The bedrock morphology within the Sound, channels the flow of water in an approximate north-south orientation. Prominent rock outcrops occur in the northern part of the site, narrowing the channel from approximately 356m to 240m. Much of the seabed throughout the study area is composed of gravel and sand; mainly in depressions within the bedrock and at the base of channels. It is anticipated that this sediment exists as a thin veneer overlying the bedrock, though this statement requires quantification. Surveys completed for the proposed development, have identified several discrete and relatively small areas of mega ripples in the sand and gravel; these are most numerous towards the southern end of the sound at -52m CD, where the ripples are up to 1m high with a wavelength of 10-15m. Larger mega ripples up to 1.5m high with a wave length of 25-35m were found to be present on the slopes and summit of a rise that is located in the centre of the channel offshore from Coal lla. Drop down video survey by SeaStar Survey Ltd. Proposed northern and southern deployment sites as well as Islay potential cable route areas were surveyed with the aim to ground-truth existing sidescan data of the Sound using a drop-down video and stills camera. The dominant biological communities found during the 2009 drop-down camera survey are typical of communities exposed to very strong water movement. These communities were dominated by Tubularia indivisa, other hydroids, Alcyonium digitatum, Urticina sp. and bryozoans (e.g. Flustra foliacea). Another noteworthy feature is the presence of a maerl bed along line 26 in the south of the study area. In addition, one thallus of live Plocamium cartilagineum was identified along line 19, a feature that might require further investigation as additional individuals and even maerl beds might be present near this location. The ground-truthing of the sidescan sonar interpretation showed some correlations but also a number of differences. Drop down video survey by Royal Haskoning in cable corridor. Three possible cable routes were surveyed following correspondence with SPR to confirm the potential routes being considered. Because of the strong tidal conditions in the sound a series of transects were planned which approximately bisected the cable routes at a number of locations along each cable route, with start and end coordinates generated prior to the survey. Each transect was orientated so that they ran in the approximate direction of the prevailing tidal currents, at 50m intervals along the cable route. As a result, each transect provided data for a buffer area of 25m on either side of the proposed cable route, along the length of each transect. The species recorded during this survey were typical of a tide swept, high energy site. The infralittoral transects were dominated by kelp and red seaweeds and the circalittoral zones had high numbers of echinoderms, including Rossaster papposus, Asterias rubens and Echinus esculentus, the anemone Urticina spp. and dead man’s fingers, Alcyonium digitatum. All species recorded are common and widely distributed around Scotland and the UK. No species of conservation interest were recorded. Regular VP observations were made from May 2009 to November 2009. Certain changes were made to the VP programme in August 2009. Approximately 48 hours of VP observations were conducted monthly and as far as possible this was evenly spread between VPs and across the daylight hours and tidal conditions. The VP survey programme was designed to collect data on the distribution, abundance and behaviour of marine mammals as well as birds. The snap-shot scans were designed to give instantaneous samples of the distribution, abundance and behaviour of all birds using the sea and coastlines within approximately 1 km of a VP, with the exception of flying birds passing through the sound. The precise position of birds was recorded in terms of a compass bearing and angle of declination. Seventeen species of seabird were recorded using the Inner Sound in the breeding season and at other times of year. This involved nine species classed as surface diving species: red-throated diver, great northern diver, black guillemot, common guillemot, razorbill, shag, cormorant, eider and common scoter. Of the seventeen species of seabird recorded using the Inner Sound eight species were classed as plunge diving and surface active species: Arctic tern, gannet, Manx shearwater, Arctic skua, kittiwake, herring gull, great black-backed gull and common gull. The shorelines and adjacent habitat along the Inner Sound were surveyed for scarce breeding birds, non-breeding birds of conservation concern. These surveys also included all terrestrial habitat within 1 km of the Development site. Walkover surveys were conducted in February, April, May, July, and September 2009. All incidental records of scarce species seen at other times were also recorded. Data on seabird distribution and abundance were collected using the European Seabirds at Sea method (Camphuysen et al., 2004). Surveys from Port Askaig to West Loch Tarbert on the Scottish mainland (i.e. including the south outer sound) were made at least once a month from April to November 2009. Surveys from Port Askaig to Colonsay (i.e. including the north outer sound) were made from May to October 2009 only due to this ferry service not being operational through the winter months. No attempt has been made to analyse these data. It will require Distance Sampling software. However preliminary examination suggests that the amount of birds using the Outer Sound was generally small. Shore based visual observations by SMRU. Land based visual observations were made from a series of sites situated along the Sound of Islay on both Jura and Islay. Both sides of the Sound were used to estimate the potential decreases in detection probability with range from land and to monitor more habitats. Observations were taken by a single observer during predefined watches. Marine mammal observations were also recorded in this survey. A total of 11 seabirds species were regularly recorded (defined as at least two records) using the development area and 1km buffer during the two years of baseline surveys. Of these, fulmar, gannet, and Manx shearwater were commonly seen but the great majority of individuals were in flight apparently transiting through the area. Common guillemot and razorbill were both reasonably common through the year and at times in the winter occurred in relatively large numbers. All other regularly occurring species, namely shag, herring gull, great-black-backed gull, kittiwake, Arctic tern and puffin were uncommon, each with just a few records. SAC data of moult and breeding surveys across Argyll and Bute were carried out using a helicopter fitted with a thermal imaging camera. Surveys take place during the moulting period, approximately between the 1st and 25th of August. On the 10th of August 2009, thermal scans were impeded by sun heated rocks. Hence visual survey was conducted instead of using thermal imaging. The main area used by harbour seals in 2009 was to the south and east of the Sound of Islay. There appeared to be important grey seal breeding communities at Nave Island, Eilean nan Ron, Eilean an Eoin, Oronsay and Oronsay Strand. Large haul out sites are located almost exclusively on the western coastlines of Islay. Hebredian Whale and Dolphin Trust (HWDT) visual and acoustic data from boat-based suveys. Designed line transect visual and towed-array acoustic surveys (focusing on harbour porpoises). Sightings of dolphin, whale, porpoise, seal species and basking shark were recorded during systematic line transect surveys. Every month at least one 10-day survey was designed and conducted to provide near even coverage of the core area. Visual surveys were carried out by two trained observers, one situated on either side of the mast on the front deck of the vessel. Observers rotated every hour to avoid fatigue. Overall, the variety of marine mammals identified using the waters immediately west of Islay is very much as would be expected for this site and habitat. Minke whales and basking sharks were not observed in the development site during summer. However, monthly surveys were too sparse to confirm their absence. Bottlenose dolphins are typically very coastal in the west of Scotland so the sightings of this species at this location (several kilometres offshore) were unexpected. In general the sightings (and detection) rates of all species were not especially high, particularly in comparison to the number of marine mammals seen on the summer legs between northern Islay and Colonsay. The comparatively low detection rates for harbour porpoises in the centre of the development site were also evident on the moored porpoise detector. Land based vantage point surveys. These were incorporated into the bird vantage point surveys.185.6 hours of dedicated marine mammal scans took place between April and November 2009. A total of 992 marine mammals were observed. Seals were the most commonly observed marine mammals, harbour seals being more common than grey seals. Seals made up 93% of sightings, otters 6% and less than 1% were cetaceans. Very low density of basking shark was observed. The following mitigation and monitoring measures are proposed within the project ES. The project team, along with Marine Scotland and other key stakeholders are currently preparing a Preliminary Environmental Monitoring Plan (PEMP) which will outline the proposed monitoring strategy in more detail. Pre-breeding surveys of black guillemot in the Sound of Islay, including the monitoring of any nest boxes provided. Nest box monitoring Behavioural Surveys. Surveys to quantify the level of human activity, in particular vessel movements, associated with the construction and operation phases of the proposed development. Land based observations from a vantage point overseeing the development site should be undertaken by an observer with suitable experience. Marine mammals and basking shark surveys will be undertaken in the first year after deployment in combination with diving bird surveys. This should be designed in consultation with SNH, SMRU and Hebridean Whale and Dolphin Trust (HWDT) to ensure data collected are comparable with available baseline data. Use of strain gauge sensors on the rotors. SPR will establish a methodology for detecting an impact on the turbine rotors equivalent to the weight of a juvenile seal. The impact will be detected in real time and a protocol will be established and agreed through consultation with SNH. Ongoing SMRU aerial surveys will provide approximate adult seal and pup numbers/ distribution and highlight any significant changes in the Sound of Islay. Otter surveys will be undertaken in advance of any onshore construction works to identify areas being actively used and works planned in such a way as to avoid or minimise disturbance to those areas Amphibians, reptiles and invertebrate detailed survey will be undertaken within a footprint in advance of construction to inform management of the construction site.